The students in Media Potential’s school holiday program have the unique opportunity to see a real newsroom in action and even get to watch news updates being put to air. You don’t get much closer to the action than this!! Thanks to Seven News reporter/presenter Emmy Kubainski for giving our students this ‘behind-the-scenes’ tour. This group from our September holiday program are each from different high schools around the state. 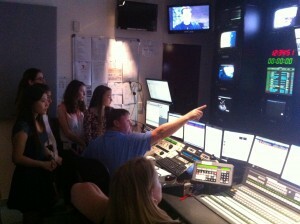 The students were also invited into the control room , where the director Troy King calls the shots… literally! There are many more jobs in the television industry apart from being on camera. Bookings are open now for our December school holiday workshops.